This beautiful photograph just came in. Photographed in the Bay of Bengal at 1200HRS on December 18. 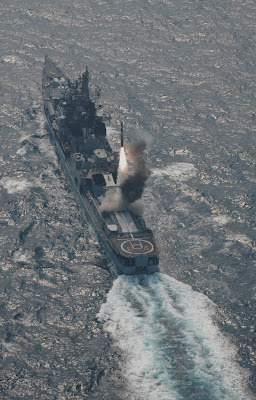 A BrahMos supersonic cruise missile lift off the universal vertical launcher on board the Indian Navy's Kashin II-class destroyer INS Ranvir. Yesterday's press release from BrahMos reveals that the three follow-on Krivak-class (Talwar-class) stealth frigates being built Kaliningrad will have the same vertical launcher modules. The BrahMos is already integrated in the inclined configuration on Ranvir's sister ship INS Rajput. According to the statement from the company yesterday, the launch makes BrahMos the world's "first and only supersonic cruise missile capable of being launched from vertical and inclined configurations from a naval platform". Nice to see INS Ranvir.I was there as EAR-5,4 in 89-92.